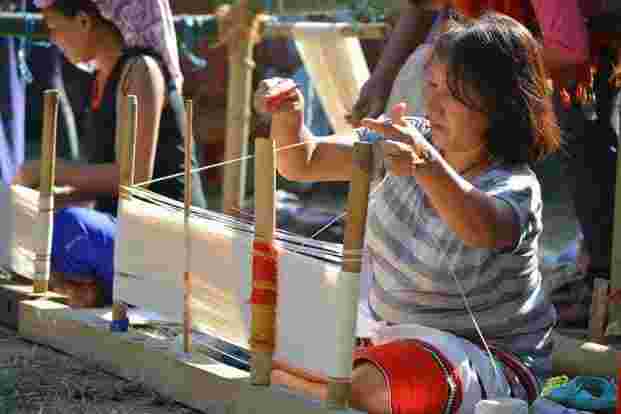 Naga women demonstrating weaving at the fifth International Loinloom Festival. Vitono Gugu Haralu, 37, grew up watching her mother weave intricate Naga shawls, cushion covers and table runners. It has been more than 30 years, but her mother’s weaving business has made little progress. The reason? Raw materials like long-staple cotton are not widely cultivated in the state and natural dyes like indigo and manjistha (Rubia cordifolia) are scarce and expensive. Additionally, marketing and showcasing at exhibitions require time and money. In the patriarchal culture of Nagaland, weaving is a woman’s job. For Haralu, supporting weavers is linked to women’s empowerment, apart from preserving the state’s indigenous loin loom crafts. In 2012, Haralu moved back from Delhi, where she worked as an activist, to focus on women’s rights. She founded Pathfinders, an NGO, in 2015. She also began volunteering with Exotic Echo—an independent organization founded in 2008 that works with rural women weavers to leverage their livelihoods. Haralu was the moderator at the fifth edition of the International Loinloom Festival held on 6-7 December—an annual initiative of the organization. The event had a global spin, as its banners proclaimed in 2016: “Taking Naga Loinloom to the world and bringing the world to Nagaland". In the last two editions, Exotic Echo invited weavers and textile enthusiasts from Ethiopia, Spain, Australia and France. In the fifth year, the focus shifted inward, with the bulk of the first day devoted to a discussion titled “Protection Of Indigenous Tribal Rights On Textiles And Handicrafts". The two-day event was held at Diezephe village in Dimapur district. Known as the craft village of Nagaland, Diezephe’s local craft traditions include bamboo and cane handiwork, as well as loin loom weaving. The venue, Weaver’s Place Homestay, doubles as a cultural hub for workshops, weaving competitions and musical performances. It also has stalls selling woven jackets, stoles, skirts, rugs and contemporary Naga jewellery. One of the major objectives was to acquaint rural weavers with the concepts of patenting, intellectual property rights (IPR) and geographical identification (GI). While the power loom is cited as an obvious culprit in making the loin loom redundant, there’s more to the story. “Currently, the biggest threat is unabashed copying of Naga patterns by brands, especially (by) fashion designers, including locals who are unaware of their symbolic significance," says Haralu. “They don’t understand the cultural context, thereby misrepresenting the community and commercially exploiting weavers." Along with empowering weavers with patents and training, Haralu urges government intervention to establish a standard wage rate, offer market support and provide subsidies to procure raw materials. “Exotic Echo is spearheading the growing movement to protect the rights of indigenous people over their traditional crafts and designs through IPR and GI tagging," says Pritha Sen, a development consultant with the organization. “Loinloom Festival had a gathering of representatives from 16 recognized Naga tribes to start a dialogue towards formulating policy guidelines and a strategy to lobby with the government." The state government acknowledged the festival’s significance this year and aligned it with the annual Hornbill Festival but more concrete steps are needed. Before Baptist missionaries gained a stronghold in the Naga hills in the 19th century, the tribes had a rich oral tradition. In an essay titled Oral Tradition In Contemporary Conflict Resolution: A Naga Perspective (2009) in the Indian Folklife journal, Lanusashi Longkumer states that the pre-literate era was governed by folk tales, songs, prayers and dance. In clothing, certain materials, colours, motifs and symbols served as markers of wealth, social and marital status, age and valour. As the local dressing norms adapted to Western trends, indigenous textiles and visual markers started fading into obscurity. Colourful synthetic and polyester are cheaper and easily available, compared to cotton that undergoes a lengthy process of dyeing. Funds allotted by the Union government often don’t reach weavers at the grass-root level. These are indicative of the broader issue of shrinking sources of income and obsolescence of traditional treasures. “The entire process of purchasing cotton, gathering dyes from the forest and then spending days to weave proves to be so challenging that the weaver would rather shift to another occupation or grow food to make a living," says Sonnie Kath, co-founder of Exotic Echo. Such organizations offer skill upgradation and market linkages, build relationships with other North-Eastern states and focus on livelihood models with young and middle-aged weavers to sustain the craft. Therein lies the seed of hope. “I believe in traditions and that they can create livelihoods," says Kath. Older women in rural areas know how to weave, so Kath attempts to train younger women to ensure continuity of the tradition. At present, Exotic Echo has 200 people associated with it, including many weavers in their early 20s. They have started growing cotton and indigo in moderate quantities. Last year, the organizing committee decided to invite more men—government officials, entrepreneurs and academics—to get them on-board for an approach that benefits women weavers. A month after the festival, Kath says weavers have gained confidence and are initiating new conversations about their rights. “My concern is sustaining the livelihood of weavers. I am not worried about the market. There is enough demand for these products," she confidently adds.